I don’t think I’ll accurately be able to capture my Quiltcon experience in writing that doesn’t ramble on for pages and pages, but I’ll do my best to give a broad overview. My biggest feeling coming away was that I could have done more! Every moment of my weekend was packed so full that I don’t think I saw the whole show. I know that I didn’t see everyone who I wanted to see. There were definitely regrets and disappointments, but there were also beautiful moments, revelations, inspiration and amazing people. I have to give so much thanks to the people at the MQG who pulled off a truly memorable and game-changing event. I took an early morning flight on Friday and dropped my bags off at my hotel. I went right to the convention center and met up with Betsy, a friend and fellow NJMQG member. “Do you want to see your quilt?” she asked. And there it was. I didn’t fully absorb it– I let Betsy take my picture in front of it with a huge grin on my face, and I kept wandering through the quilts. It was impossible to walk through the show without seeing a familiar face from Instagram or just starting a conversation with a fellow quilt aficionado. There was a freeing absence of small talk– we would launch into talk about design, technique, or just stand in silence. After a whirlwind of a Friday, which ended with drinks alongside some energetic and inspiring MQG leaders, I was ready to absorb some information. Saturday started early with yoga for quilters, leaving me feeling strong and centered. My first lecture was with Nancy Zieman of Nancy’s Notions and Sewing with Nancy. Now, shame on me for not familiarizing myself with Nancy’s work beforehand, but the name of the lecture was “Starting a Business, Stitch by Stitch.” I expected some logistical business advice. But the lecture was Nancy’s story of building her business in the 70’s and 80’s in a completely different era for the handmade industry. After waiting months to get to Austin and take a lecture, I have to admit that I was disappointed. Some of it was self-imposed, admittedly. I could walk away with some bigger philosophical points, but the details just weren’t relevant for my experience or goals. After that, I had a class with the quilters of Gee’s Bend. 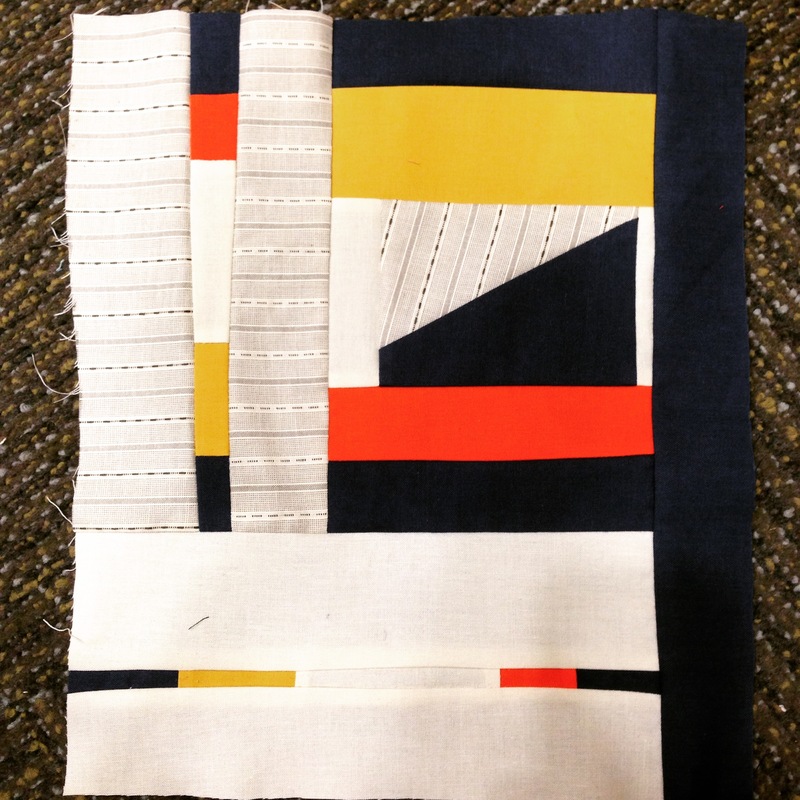 Thankfully, my expectations of the class were just to sew and get a chance to ask questions of the women who have inspired so many modern quilters. There was not a lot of teaching provided, per se, but after seeing so many inspiring quilts, it was nice just to sit and sew. I improvised a bit with the solids and one shirt print that I brought, and Mary Ann Pettway showed me something that she had made while in Austin. I treasured the chance to tell China Pettway about Peggy, who served as Vice President of NJMQG and first told me about Gee’s Bend. Peggy passed away last year and would have loved to meet them. The keynote with the Gee’s Bend quilters was thought provoking on a number of levels. The disparity in experience between the quilters on the stage and the quilters in the audience felt inspirational, grounding, and even uncomfortable and then back again. Some visual information would have been nice– I always enjoy a lecture with pictures and slides. It also took awhile to get to talk about quilts. But those women are entirely themselves and they use their platform to spread their (often religious) message. The quilts of the collective have inspired modern quilters for decades, and it is important to keep discussing their art and their experiences. The NJMQG charity quilt hung right in the hall by the lecture rooms! My unexpectedly favorite lecture came from Heather Ross. 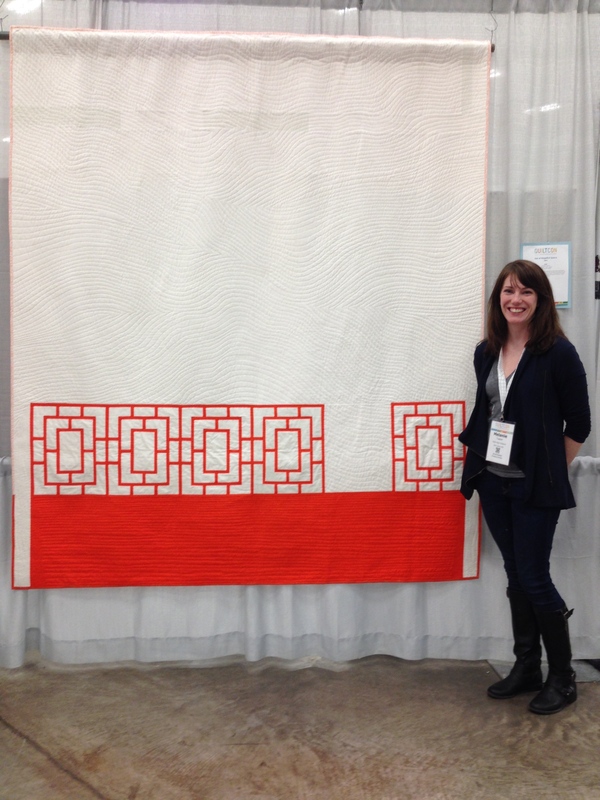 It was called “How to Design Fabric.” I’ll admit that I don’t have a strong desire to design fabric, but I love hearing how successful creative people work, and Heather really showed her process. It was a mix of concrete tips (like don’t check email before 1pm, and get into a creative mindset by reading poetry) and her own specific experiences (“when the work makes me cry, I’m almost done”). She balances her own artistry with a mind for business, and it was refreshing and inspiring to hear her talk and joke off the cuff. I have to write about the people that I spent time with, whether walking the show, eating fried chicken (or bbq or donuts or tex mex), drinking margaritas or dancing to “Apache.” Many were friends through Instagram or this site, and each and every one of them pleasantly surprised me with their kindness and enthusiasm. Every day since I’ve been home, I think, “Oh! I need to find Stephanie”, or “Nicole would love that hexagon sign,” or “I hope Karin doesn’t get too much more snow.” I feel like my world grew and shrank at the same time. I tried to list all of the people who I enjoyed, and I just felt so grateful. Written by Ginny ( @minnowpeck ) during our awesome day together. All the hearts. There were so many people that I met, but even more that I feel I missed. To the many online friends that I saw across the room but didn’t talk to, or ones that I didn’t get to meet, I hope we continue to email and meet face to face next time. This was definitely a learning experience, and I hope that if I go to another Quiltcon I’ll know how to plan my time and activities better. I didn’t walk through the entire vendor area, but luckily I did get to visit the Monster Hexi quilt that I made for Cloud 9 Fabrics. Even though it was crazy and hectic and overwhelming, I am so thankful for the opportunity to have been there. I spent the flight home writing and processing and sketching new quilts. I’m sure I’ll be thinking about and remembering my experience in the days and weeks to come. I have a few isolated stories and vignettes that I’ll try to post in the week ahead. 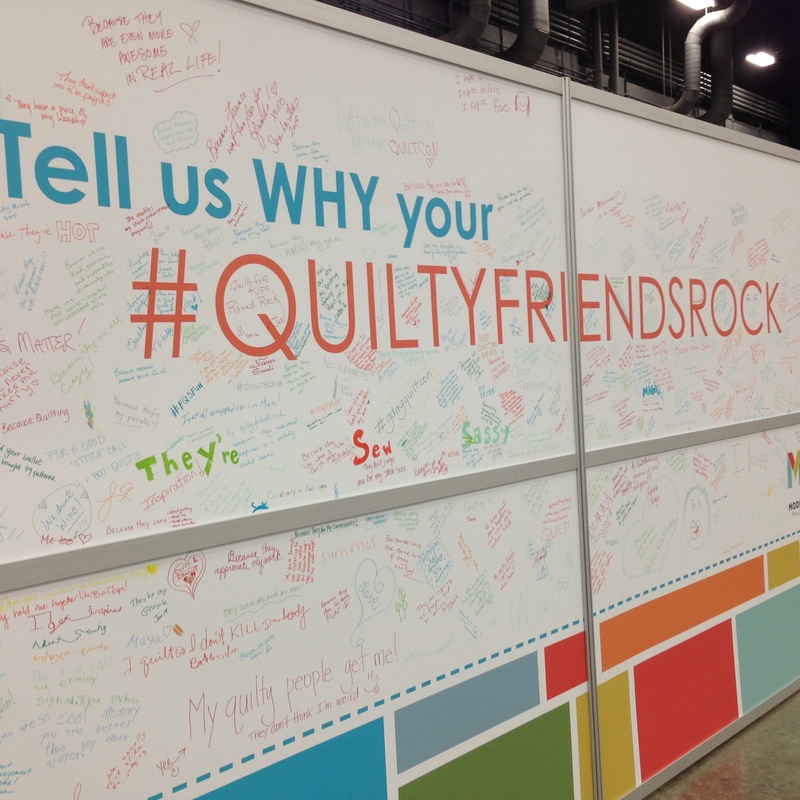 I also talked with a few Quiltcon friends about partnering for content and new ventures, so stay tuned. I am glad to have been able to say hi after the yoga class on Saturday morning. 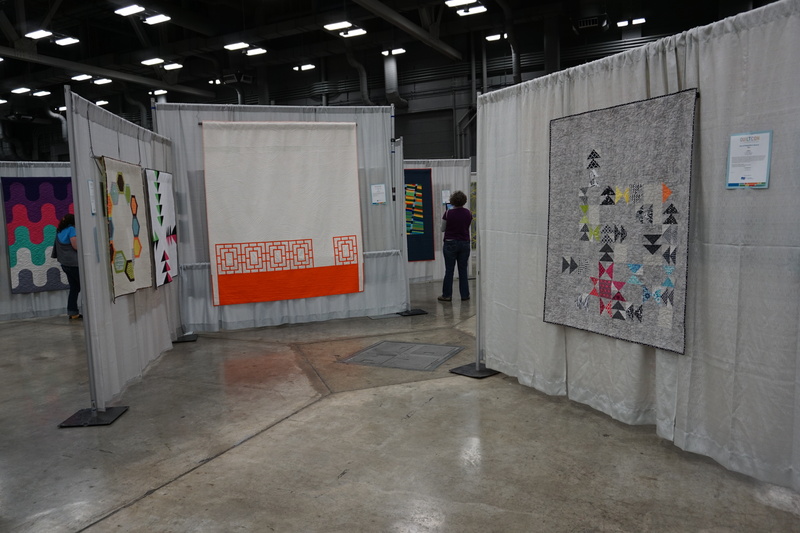 I really agree that the whole experience was a whirlwind, and I feel like I need to take some time to thoughtfully plan how it is going to reframe any future QuiltCon experiences for me. I loved seeing you and I am so grateful for your friendship, Mel! 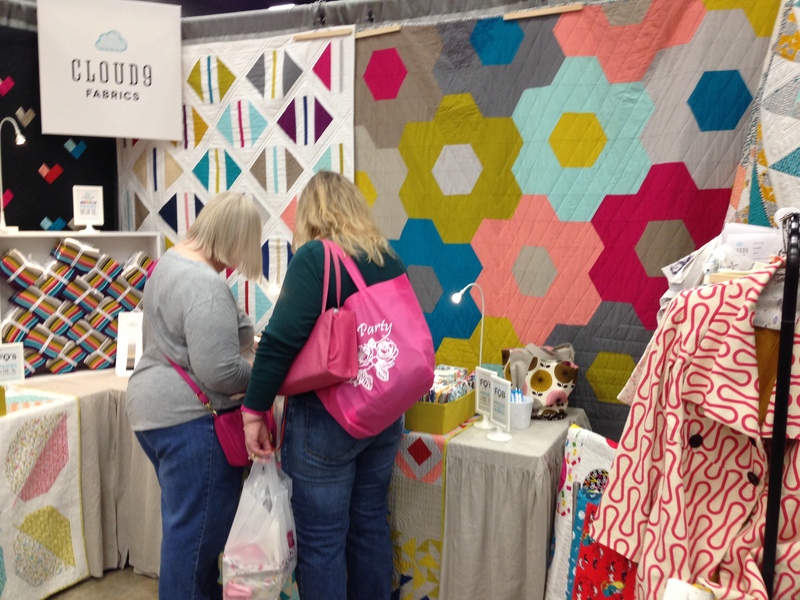 Oh my gosh – How did I miss the fact that you made that gorgeous giant hexi quilt??? I must be living under a rock. You’re amazing. I love your recap post… you know, I felt the same way about a couple of lectures I attended; I later realized that the title of the lectures were SOOOO important and shaped our expectations, especially given that there were very vague descriptions provided at the time we signed up. I felt disappointed at times in a couple of lectures and even one class, and it was always due to the fact that my expectations of what I was going to hear or learn were so different than the topics actually covered. Lesson learned… I’ll try to be less speculative next year (or hope that the descriptions for lectures and classes are a lot more detailed! ).